(Nanowerk News) The oxidation of toxic carbon monoxide (CO) to carbon dioxide occurs every day in millions of cars. Despite being one of the most studied catalytic processes, the exact mechanism of interaction between the carbon monoxide molecule and the catalyst, often platinum, is not fully understood. An important step in the reaction is the adsorption of CO on the surface of the catalyst. A team of scientists from the ESRF and the ETH in Zurich (Switzerland) has managed to see how the electrons in the platinum reorganize as the adsorption is taking place and why catalysts are “poisoned”, i.e. why their activity is reduced (" In Situ Characterization of the 5d Density of States of Pt Nanoparticles upon Adsorption of CO"). It is the first time that this type of experiment is carried out at the same high temperatures and pressures as in a real car exhaust catalyst. 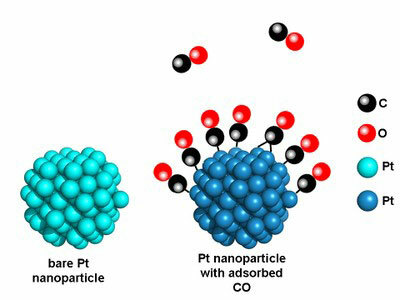 A bare platinum nanoparticle is shown on the left, a CO-covered particle on the right. When the CO or other toxic gases get in contact with the catalyst, a noble metal such as platinum, they oxidize to become less dangerous gases. In this case, CO turns to CO2, which the car expels via the exhaust pipe. However, the efficiency of the catalytic conversion decreases considerably when the catalyst is at low temperature. The scientists from the ESRF and ETH in Zurich determined how the CO poisons the surface of the catalyst. The strong bond between CO and the platinum blocks active sites and makes the metal less susceptible to reaction with oxygen, lowering its reactivity. Scientists around the world have studied thoroughly the electron structure of adsorbed CO using techniques like vibration and soft X-ray spectroscopy, but few have studied the electrons in the platinum, and it has proven extremely difficult to do it on nanoparticles under ambient pressure. In fact, very few experimental techniques are compatible with the required temperature, gas environment, and the low metal concentration of supported nanoparticles. The team has developed a technique where they can investigate the platinum electrons that take part in the bond with CO. “We have, for the first time, combined a novel experimental and theoretical approach with an important application in catalysis research. This enables us to look at the adsorption of CO on Pt nanoparticles from a new perspective that was previously not accessible” explains Pieter Glatzel, scientist at the ESRF. The next step is to look at the changes in catalyst structure under actual catalytic conditions, such as those occurring during the preferential oxidation of CO and the water gas shift reaction. “We are very hopeful of this new technique and are sure that it will enable us to improve our knowledge about catalytic systems and, with it, make them better”, says Jeroen van Bokhoven, scientist at the ETH.